Dark gray marble is coupled with soft earth tones to create a refined and sophisticated surface for this natural marble chess board. 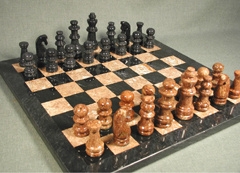 The effect of these colors is enhanced through the high polish that rests atop the board and the accompanying pieces. 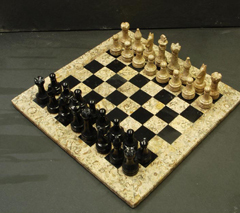 Stylish yet classic, marble is a material that has been used to build the palaces of kings, as well as some of the great works of art and architecture from throughout history. 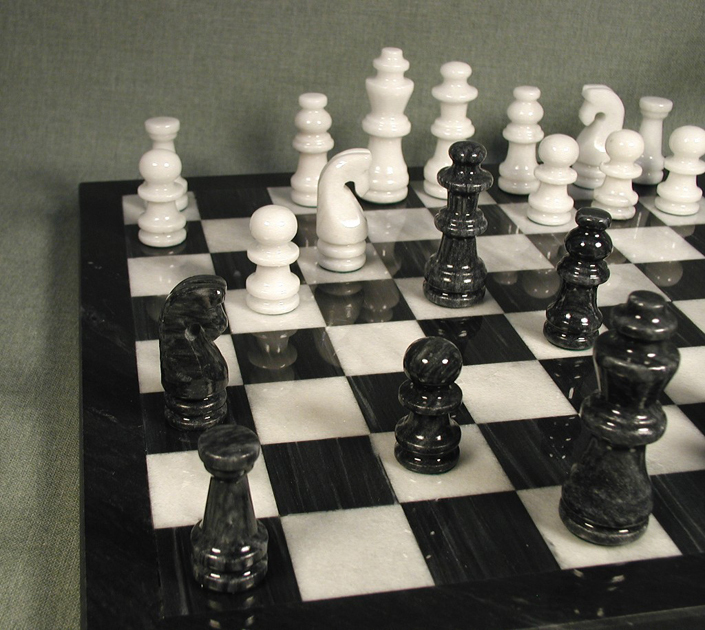 A marble chess set is a simple yet sophisticated way to bring the glorious history of this famous material into your home. 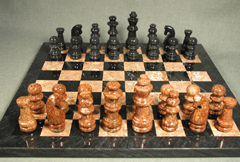 Polished Natural Onyx - 12" X 12"
This stunning natural chess set is made up of two onyx multicolors, each of which duels for visual supremacy across face of this polished battlefield. Within the stone, great viens of color erupt in startling patterns, creating a sense of energy and life within the surface of the stolid stone. 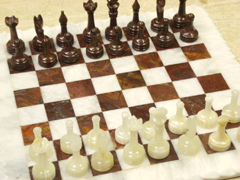 Cool to the touch and polished to smooth perfection, each piece is a work of natural art that has been refined down into a vision of human design. 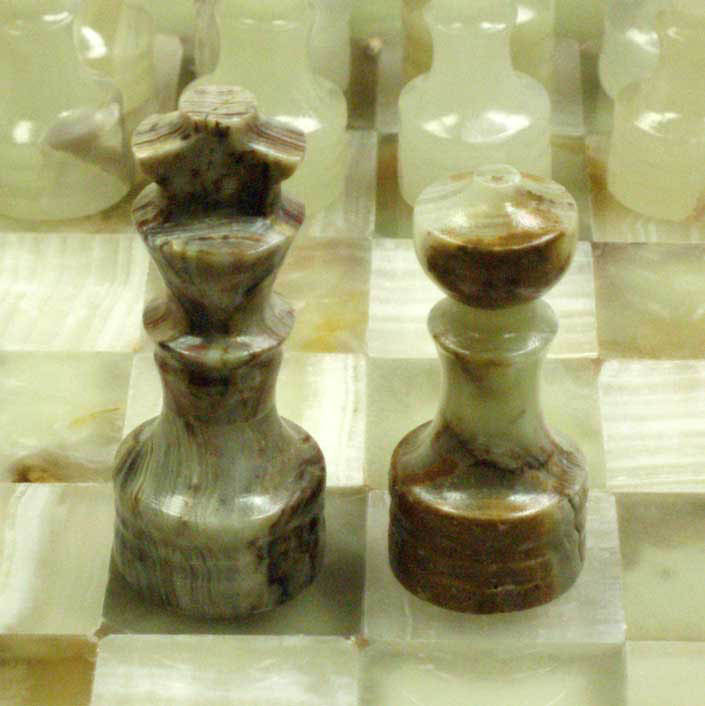 This duality of natural chaos and forethought of design is a powerful effect which gives each piece a unique personality. 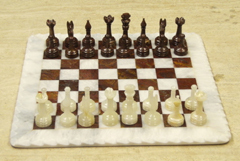 Polished Natural Marble - 16" X 16"
This is the classic vision of what a chess set should be. Black and white, two diametrically opposed tones, facing off across the great checkered battlefield. When you think about the chess set that would rest in a CEO's office, or would be sitting by a kings throne, this is what often comes to mind. 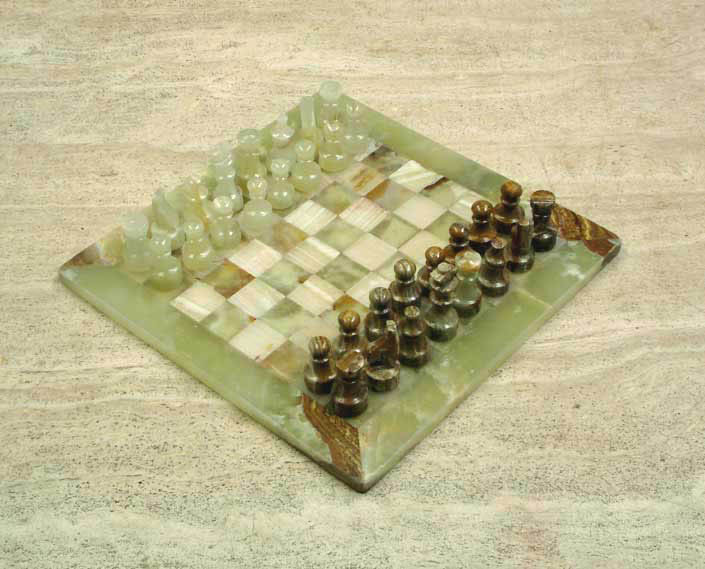 The delicate yet stark beauty of the polished marble, cool to the touch, each piece a perfect vision of what it was meant to be, this is the purest conception of elegance and beauty that can be captured in a game set. 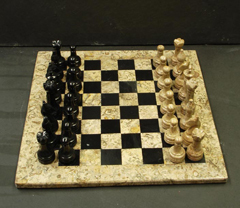 Polished Natural Marble - 12" X 12"
The surface of this elegant and sophisticated chess set is actually a journey of a million years into the primordial past of the earths geological history. 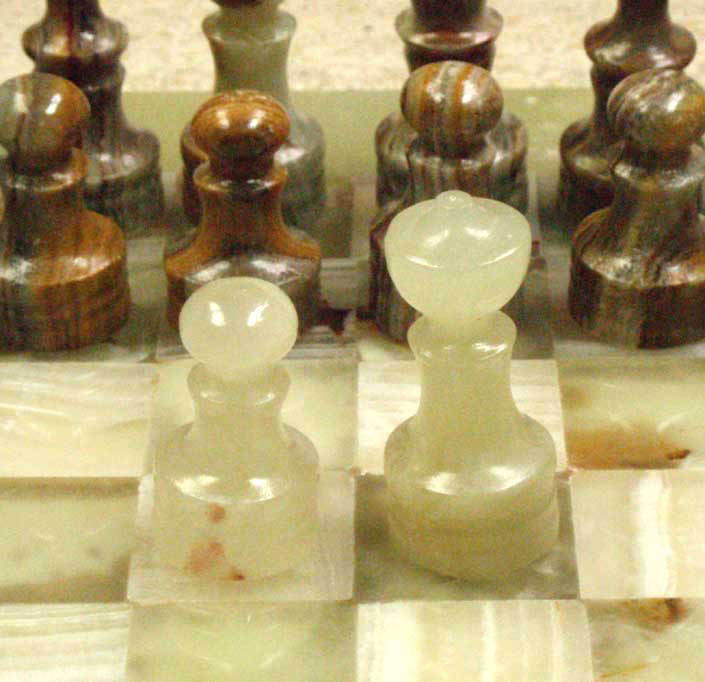 If you look closely you will see the secrets, the tiny hints of life, the fossilized imprints of ancient stories that are just waiting to be discovered past the polished perfection of the marble facade. 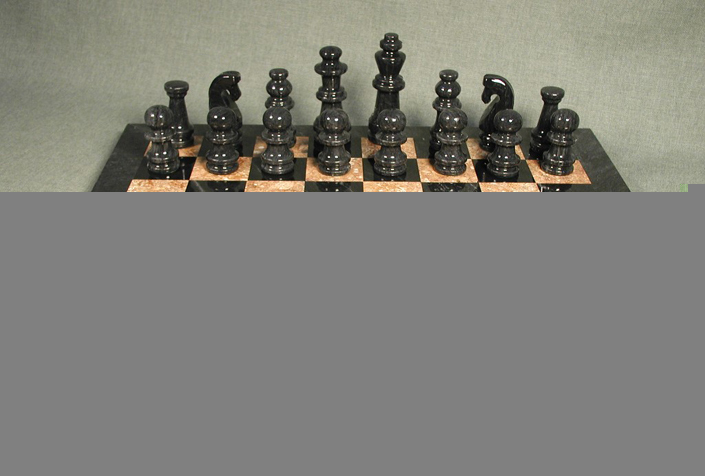 These tiny pictures, patterns of the past, dot the surface of the entire board and even rise up through the figures of one of the opposing chess armies. 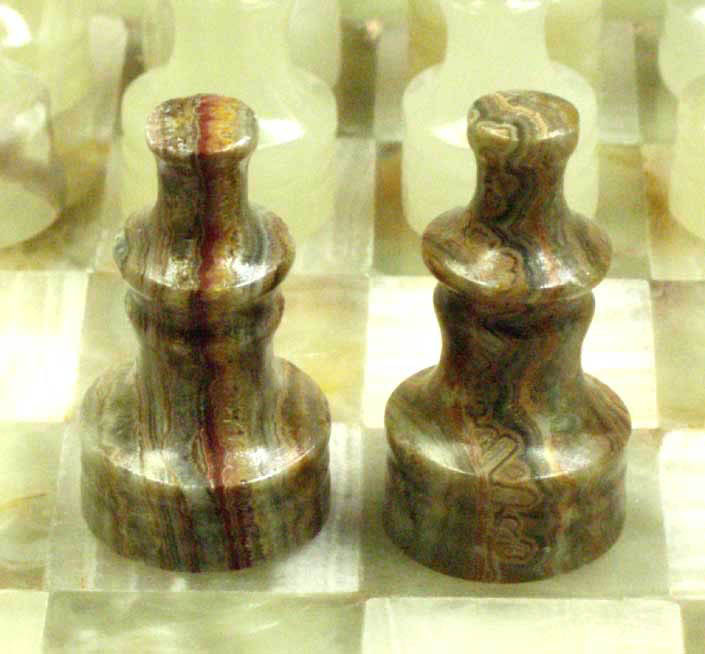 These distinct features lend a unique personality to the pieces, giving them an almost lifelike energy. 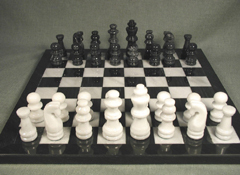 This chess set is a stunning vision of creamy white marble mixed with its deep midnight counterpart. This delicate mixture of opposing tones lends an elegant ambiance to the entire piece. 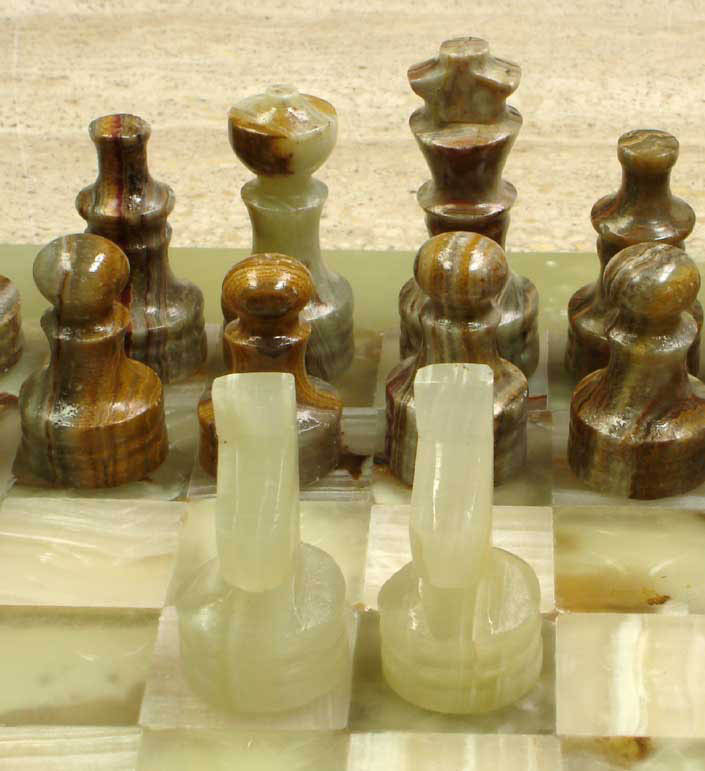 This effect is further enhanced by the inherent nature of the marble, born of a mountain, fierce and deteremined, yet refined, shaped, polished, focused into the perfection of the pieces shown here. 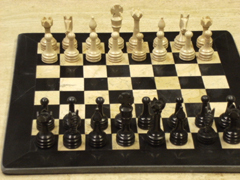 Fiery red tones explode across the tiny squares of this magnificent chess board, and run all the way up into one of the opposing armies that rests on the surface. Constraining this fire and giving it focus are the soft clouds of its white counterpart. This dichotomy of fierce and gentle serves to strike a perfect balance, an even match of philosophies whichgives the overal set an inherent dignity and power.